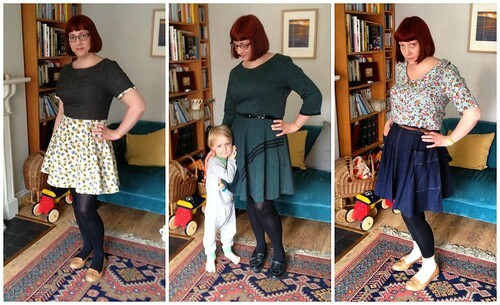 Lazy Seamstress: Me Made May is all done! What a month! I did it, a whole month of wearing at least one me made item each day. There were a few repeats, but that's OK. I've learnt where the gaps are in my Me Made wardrobe, and have a clearer plan of clothes I want to make to fill those gaps. Most importantly I've managed to wean myself off cheap dresses from a certain high street store. I was starting to do that anyway, but Me Made May has convinced me once and for all.That feels good! So, my plans now include a good clear out of my wardrobe, followed by a sensible plan of my sewing needs, which looks like it will consist of some good solid colour basics, a few Summer dresses, and digging out those lingerie patterns and fabrics. All you have made some very lovely things. I too have realised how much I don't need to shop woot! Thank you, it's great not shopping isn't it? 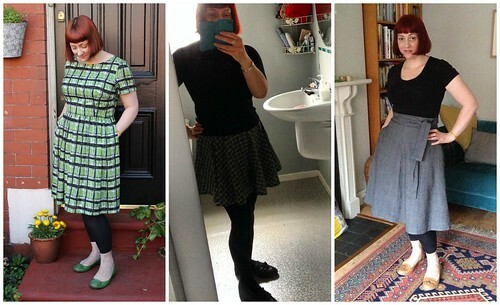 I love the grey skirt in the top right pic. it looks comfortable and flattering. :) Would you mind sharing the pattern name? I think you've given me the courage and inspiration to try and sew clothes! I quilt and sew toys, but haven't tried anything like this yet! I love the fabric you've used for your latest Emery. I wish I could find it online. My goodness. What an awful typo. It's the blog that I'm fond of, of course - not your wetland habitat nor your toilet facilities. I got a free shall with this dress which I was not expecting. The dress is absolutely perfect. It is a little see through on the back which does not match the photos, but I don't mind.